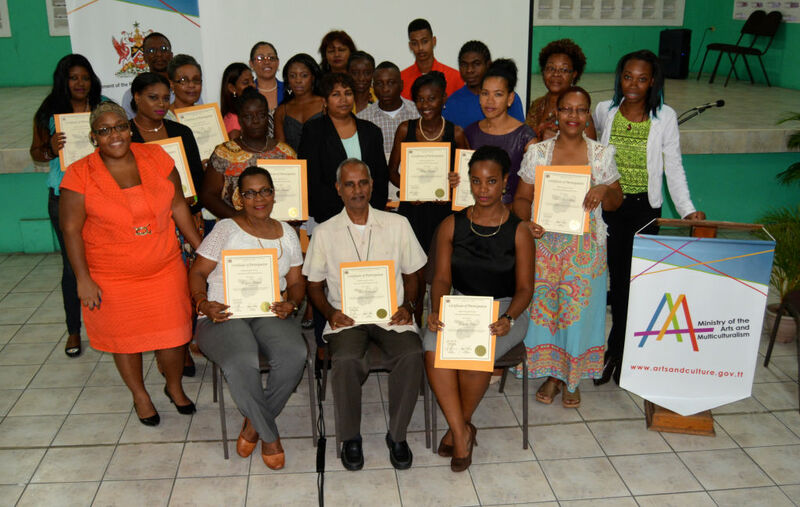 Head of the Remember When Institute, Alicia Blake, with graduates of the Siparia Cultural Inventory Training Programme. The Research Unit of the Culture Division is tasked with developing initiatives that support the preservation of our tangible and intangible cultural heritage. A pilot project guided by this objective was recently brought to an official close in July this year. Members of the La Divina Pastora Church in Siparia and the wider community underwent an interactive short-course in Multimedia Skills Training. Training was facilitated by Mr. Joseph Valley, a 2014 mentor for the area referred to as Heritage Preservation Through Film, in one of the ministry’s flagship training programmes, Mentoring by the Masters. Last month, officials from the Ministry of the Arts and Multiculturalism presented certificates of participation to the graduates at a special ceremony. The session closed with discussions about future plans to continue the much needed inventorying of the Feast of La Divina Pastora and Sopari Mai Devotions native to Siparia and rich in intangible cultural heritage elements.